We couldn’t have picked a more beautiful day in St. Augustine for Hayley and Jake’s wedding ceremony and reception this past March. With guests coming from as far away as Australia to attend this destination wedding in St. Augustine, we’re so glad that our fair city shone it’s brightest for their special day! Wedding planner Susan Zackin of Z Event Company traveled all the way from New Orleans to help make Hayley and Jake’s dream wedding vision a reality. 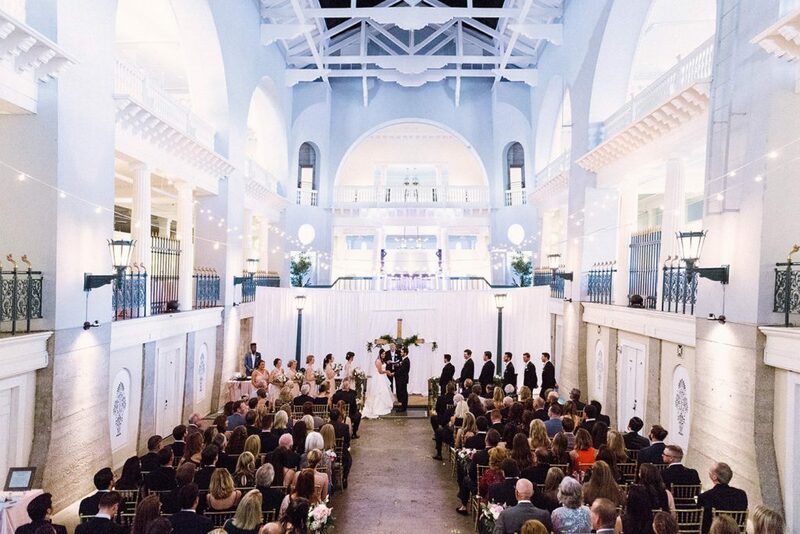 She worked with locals Rachael Kasie Designs and St. Johns Illuminations to transform the Historic Pool and Mezzanine first into a romantic backdrop for the wedding ceremony, then later in the evening into a swanky lounge-style space for the reception. Guests danced the night away to the sounds of DJ and violinist Timothee Lovelock. At one point, Timothee surprised the bride and groom with an amazing violin performance where fireworks actually shot out of his instrument. It was a truly unforgettable moment! We’re so glad that Peppermint Wind Photography and videographer Brady Bigalke were there to capture every detail.